On Good Friday we hear the story of Jesus’ trial, passion (suffering), death and burial. During this service our choir sings about His passion when spoken words alone cannot suffice. Please join us for this heart-rending choral service. We also offer a pre-service discussion of the work at 6:30 p.m. in the church and an organ prelude (Buxtehude’s Praeludium in g minor, BuxWV 149) at 7:10 p.m. All are welcome. 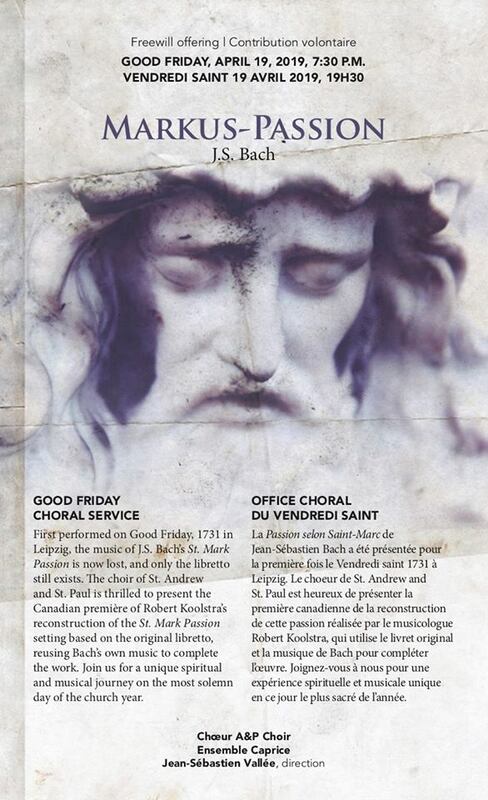 Our choir will present the first Canadian performance of a reconstruction of J.S. Bach’s long-lost St. Mark Passion, BWV247. No reservation or tickets are required; your freewill donations support the musical ministry of the church.